The British Virgin Islands (BVI) offer crystal clear waters, pearly white sand beaches, plenty of seclusion and spectacular scenery. These islands were once a haven for pirates, and now are a welcoming spot for those who seek escape from mega tourism. BVI consists of approximately 60 islands - of which only 15 are inhabited. Many of them are just splits of land, rocks or national parks. Some islands have just a single beach bar, others offer shipwrecks for divers. One thing for sure - each of these islands are unique and worth seeing. It's fairly easy getting around BVI by ferry. It's no wonder this is one of the world's top sailing destinations with more than 40 islands within an hours sail of each other. The trade winds are steady, and the seas are calm. Once you set sail into the channel, there are hundreds of protected bays to anchor and enjoy. 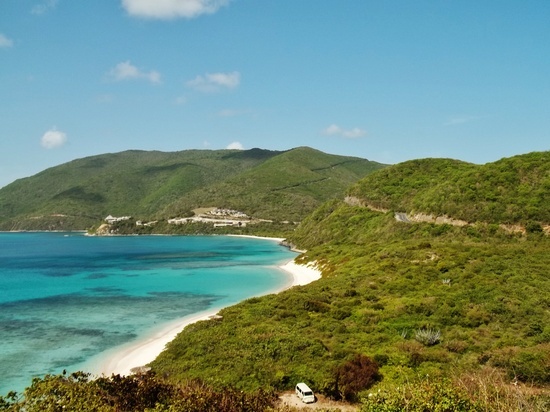 The most significant islands for tourists are Tortola, Virgin Gorda, and Jost Van Dyke. TORTOLA is the bareboat capital of the world and the largest and most populated in the BVI chain. The trade wind breezes blow over the secluded white sand beaches and hidden coves against a backdrop of lush green hills. VIRGIN GORDA is the second largest island in the British chain. It's located just 12 miles east of Tortola, and 25 miles east of St Thomas, USVI - and is my favorite BVI destination. Christopher Columbus named the island Virgin Gorda, or "Fat Virgin," because he thought the mountain on the island looked like a protruding stomach. With mountains on the northern side reaching 1,368 feet, the opposite side of the island is flat, with large boulders. JOST VAN DYKE - Jost (pronounced ‘yoast) is a tiny island that is just 4 square miles, but has a reputation as a very jovial place. Here you'll discover an island that remains basically untouched by development. The history of the island goes back 400 years with adventurers and seafarers. The island was named after a Dutch pirate, and in the 1800's many Quakers came escaping religious persecution in England. Back in the 60's a man named Foxy build a bar, and since then Foxy’s Tamarind Bar has become one of the best-known bars in the Caribbean. ANEGADA is located just north of Virgin Gorda, and the island actually floats on a remote reef. At its highest, its just 28 feet above sea level. It's best described as a fantasy oasis with large salt ponds, giant rock iguanas, flamingos, and blooming cacti. The pristine beaches are surrounded by a maze of coral called Horseshoe Reef. NORMAN ISLAND - Legend is this was the place that inspired Robert Louis Stevenson's novel "Treasure Island" - located across the Drake Channel from Tortola, and one the deserted islands in the chain. It offers some of the best snorkeling caves in the BVI where you can view colorful coral and spectacular marine life. Adventurous hikers can climb to Spy Glass Hill, the island's central ridge. Great overview of the breath-taking, diverse BVIs! If ever in Road Town, Tortola, check to see if Katlo is in the Village Cay Marina and drop in to say hello to Captain Patrick! Or you might see us moored elsewhere snorkeling or showing our guests the beach bars.